Gardenstyle Outdoor Decor is made by artisan manufacturers of pottery, statuary, and fountains, around America, and in Italy. We have twenty years experience working with designers and homeowners to achieve the best outcome with selection, finishes, and specs for your outdoor design project. Mail or call for product information and motorfreight quotes, and to order. 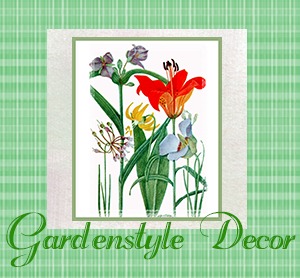 Gardenstyle orginal design for Home and Garden Living is designed by Leigh Fulghum, currently made by Zazzle manufacturers, shipped to you 100% satisfaction guaranteed.